There is still time to grow your own toothbrush. And save money and give to charity doing it. 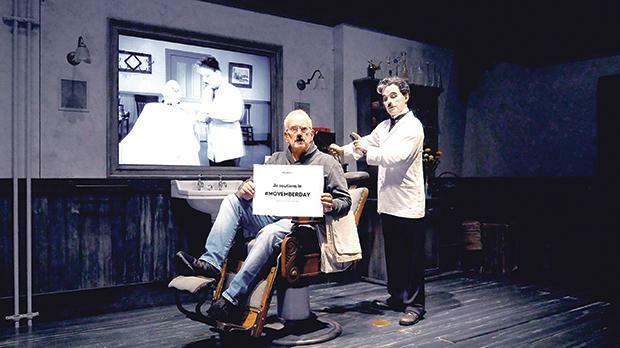 Between November 24 and 25 Chaplin’s World is supporting the Movember Foundation that funds men’s health programmes worldwide, offering discount admission to the museum in his former home in Switzerland. YMCA biker horseshoes and Dalí curls are also being accepted at the ticket office. But toothbrushes will have priority. 2019 marks the 130th anniversary of Charlie Chaplin’s birth. Chaplin – who believed that “a day without laughter was a day wasted” – is still providing plea­sure through his museum in his old home in Corsier-sur-Vevey overlooking Lake Geneva. And an hour from Geneva. The 150-acre ‘eco-friendly engi­neered’ Chaplin’s World Complex features ‘successive multi-media experiences’, ‘ambiophonic acoustics’, ‘immersive décor’ and displays, previously unseen private photographs, letters, manuscripts, personal effects and other memorabilia. His writing desk is displayed as well as some of the Manoir’s ori­ginal Louis XIV furniture. There is also a special walkway to Chaplin’s grave. Shared with his wife Oona, daughter of the playwright Eugene O’Neill. The museum traces Chaplin’s extraordinary rags to riches career. He was born in the Victorian boot-making district of Walworth, south London, in 1889, the son of vaudevillian Charlie Snr, the son of a butcher, and ‘soubrette’ (operatic soprano) and sweatshop sewer Hannah, an Irish shoemaker’s daughter. His childhood, he wrote in My Autobiography (1964), was “in continual crisis”, his life “a quagmire of miserable circumstances”. The museum chronicles jobs as doctor’s dogsbody, pageboy, flower-seller, glass-blower for a day and toy maker, making boats from shoeboxes and grape packing straw. It tells of his father’s alcoholism and early death (his daily diet was six raw eggs in port wine), homes next to graveyards, abattoirs and pickle factories, the homes for destitute children and his syphilitic mother eventually being sent to a lunatic asylum. It follows his formative years clog dancing with the Eight Lancashire Lads and the 21-month tour of the US with Fred Karno, the father of slapstick. The museum reveals how he formulated his creative philosophy, summed up by “Nothing is permanent, not even troubles”. Chaplin became a ruthless perfectionist, creating “laughter which does not pretend to cure but only to console”. Being a clown, he believed, placed him far higher in life than any politician. He met everyone from Einstein to Gandhi. Various rooms in the museum are dedicated to his Keystone period (1914-1917), the debut of his Tramp persona in Kid Auto Races At Venice and the formation of United Artists (1919). By 1926, he was earning £10,000 a week. And spending £1 million on a film (Gold Rush). He married three teenage actresses, and the death of his three-day-old son, Norman, in­spired the pathos of The Kid (1921), shown in over 50 countries. He built this own “English cottage-style” studio in Hollywood. They became the A&M Studios and now home of Jim Henson Company Studios. The original Superman TV series was shot there. Chaplin stubbornly refused to take on the talkies (movies with sound), saying, “I am a pantomimist and in that medium I am unique.” However, after a few flops, he moved from social realism into making overtly political and social satires like the silent Modern Times (1936) and The Great Dictator (1940), remembered chiefly for its five-minute rant finale. The 138-room four-star Modern Times Hotel has just opened down the hill from the museum in St Legier-la-Chiescz. Chaplin played the cello, violin and piano and composed his own soundtracks. Nat King Cole, Diana Ross and Michael Jackson all recorded his song Smile. And Dame Petula Clark had a UK No. 1 with his This Is My Song. His Steinway, as well as many artefacts, are displayed at the museum. Chaplin chose Switzerland after having become disillusioned with the US. Hounded for his alleged communist sympathies and in the throes of an embarrassing paternity suit, his re-entry permit was revoked by the FBI while he was on his way to London for the premiere of Limelight. He refused to return to the “moral pomposity” of the United States, “that unhappy country” with its “hate-beleaguered atmosphere”. Chaplin is the area’s most famous former resident although writer Graham Greene and actress Audrey Hepburn also lived close by. Actor David Niven is buried in Chateau d’Oex. The novelist Vladimir Nabakov lived at the Montreux Palace. The 19-room, three-level, neo-classical mansion was built in 1840. Its previous owners included a watchmaker, an industrialist, two sisters and an American diplomat. Chaplin’s widow Oona died there in 1991. You can visit the Beau Rivage hotel in Lausanne where the Chaplins stayed before moving in, his fa­vourite restaurant, Auberge de L’Onde, among the 16th century winehouses of Saint-Saphorin. Other haunts were his favourite winery, Au Clos de la Republique in Epesses and Vevey’s Cinema Rex, which he used to dub his films. Chaplin’s elder half-brother Sydney, who died in 1965, is buried in Clarens-Montreux near Vevey. A former bugler seaman, he ended up as Charlie’s business manager. He opened the first privately-owned airline in the US. Chaplin was knighted in 1975, three years after receiving a standing ovation on his return to US to receive an honorary award from the Academy of Motion Picture Arts & Sciences. Chaplin has statues to him not only in the new museum and on the waterfront at Vevey but also in London, Ireland, Barcelona and even Hyderabad. His moustache is one of the most famous of its times. Although it was not home-grown. False moustaches will not gain free entry to the museum this November. 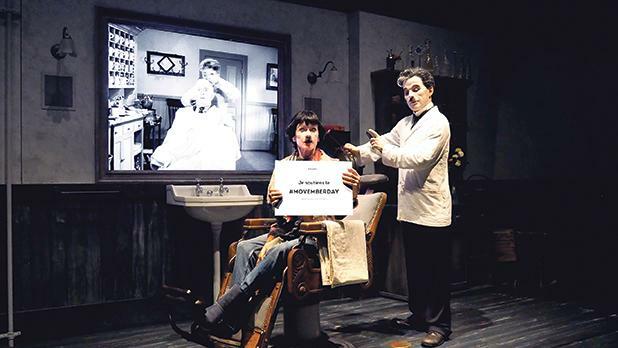 For more information, visit http://chaplinsworld.com .